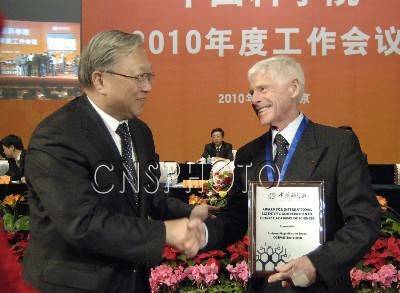 Roger-Maurice Bonnet, President of the Committee on Space Research (COSPAR), is one of the recipient of the 2009 International Scientific Cooperation Award of the Chinese Academy of Sciences (CAS). Professor Roger-Maurice Bonnet graduated from the University of Paris in Physics and Astronomy. The early scientific work of Professor Bonnet was focused on solar physics. As early as 1963, he launched the first French space astronomy experiment on board the Véronique rocket from Hammaguir in Sahara. Professor Bonnet is the author of more than 150 articles and scientific publications, and he has been the recipient of many awards and honors granted by a number of agencies such as the Silver Medal given by the French Space Agency, the Emil Award of the International Academy of Astronautics, and the COSPAR Space Science Award. Professor Bonnet has contributed greatly to the development of international cooperation with China in space related matters. During the period he was Director of Space Science Projects at the European Space Agency (ESA), Professor Bonnet was instrumental for collaboration between CAS and ESA, and he promoted the cooperation required for the success of the Double Star (DSP) and Cluster Programs. He encouraged the Center for Space Science and Applied Research of CAS to build the ESA Cluster Program Data Center and nurtured program cooperation on DSP between ESA and CNSA, the first space system cooperation between Europe and China. Professor Bonnet also supported China’s increased involvement in COSPAR and other international space science organizations, and he was president of COSPAR when the 36th COSPAR Scientific Assembly and Associated Events was held in Beijing in 2006. The joint COSPAR/CAS Jeoujang JAW Award was also established during Professor Bonnet’s presidency. The Jeoujang Jaw Award recognizes scientists who have made distinguished pioneering contributions to promoting space research, establishing new space science research branches and founding new exploration programs. This honor is the first international scientific award to be co-founded by CAS and an international organization. During the past five years two COSPAR Capacity Building Workshops were also held in China, providing many young Chinese researchers the opportunity to enhance their research capabilities with a concomitant impact on the development of space science in China.